The B61 nuclear gravity bomb, deployed at most U.S. Air Force and North Atlantic Treaty Organization (NATO) military bases, has almost five decades of service, making it the oldest bomb in the US stockpile. Numerous programs have modified the B61 for safety, security, and reliability since it entered service in the late 1960s, including four B61 variants. However, the weapon system is quickly aging and has hit the upper extreme of its lifespan, as it seems the Pentagon is about to extend the life of the nuclear gravity bomb by another two decades. The upgraded, B61-12 LEP will replace all of the bomb’s nuclear and non‐nuclear components for another two decades, and improve the bomb’s safety, effectiveness, and security. This life extension program will address all age-related issues of the weapon, and enhance its reliability, field maintenance, safety, and use control. Los Alamos National Laboratory and Sandia National Laboratories are the design and engineering labs for the B61-12 LEP. In a recent presentation, the final design review will be conducted next month. Both firms indicated the first production unit would occur in FY 2020. In total, the bomb is 12 feet long and weigh approximately 825 pounds. 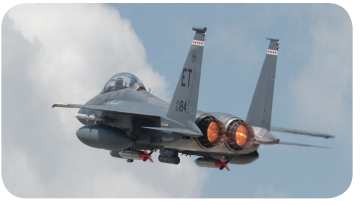 The weapon will be air-delivered on current strategic (B-2A) and dual-capable aircraft (F-15E, F-16C/D & MLU, PA-200) as well as advanced aircraft platforms (F-35, B-21). Last week, Sandia National Laboratories released an unclassified five-minute video showing the entire preparation process and the actual drop of inert B61-3/4 tactical nuclear bombs at the Tonopah Test Range in Nevada back in July 2017. The data compiled from the test is expected to be submitted into a report for the final design review next month before the first production unit is manufactured sometime in 2020. 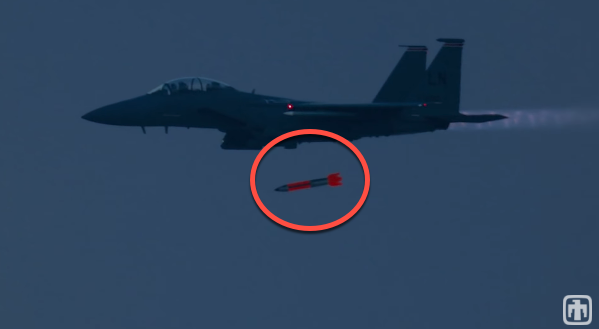 The ultra-high-definition video centered around two McDonnell Douglas F-15E Strike Eagle jets deploying spin-stabilization rockets to drop B61-12 test bombs. A few seconds after the drop, parachutes open and the GPS-guided the dud slowly to the ground. 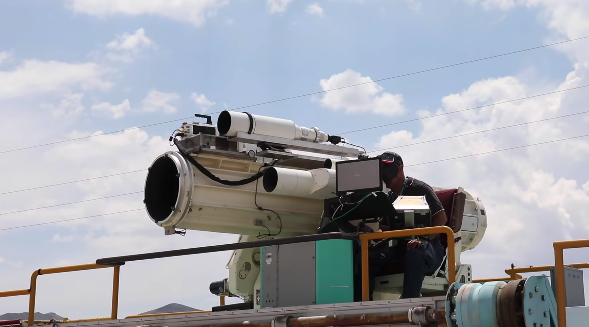 The video shows a large team using sophisticated sensors to monitor the tests. The video closes with ground crews retrieving one of the inert nuclear bombs. It also shows a bunker where three B61-12 test bombs appear to have recently been dropped, as the video only showed two. The bomb’s yield ranges from 0.3 to 50 kilotons. The first of the two nuclear weapons ever used, against the Japanese city of Hiroshima, had a 15-kiloton yield. 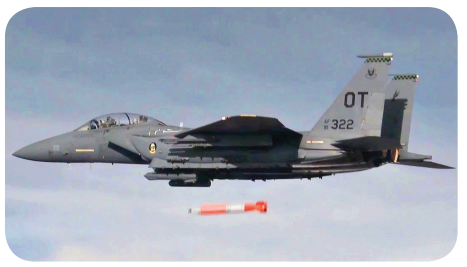 The tests are part of a $7.6 billion life extension program of the B61s, which as we described above, aims to “refurbish, reuse, or replace all of the bomb’s nuclear and non‐nuclear components” and extend the service of the bomb by at least two decades. With the “first production unit” scheduled for completion in 2020, perhaps the Pentagon is preparing for future military conflict with Russia and or China.